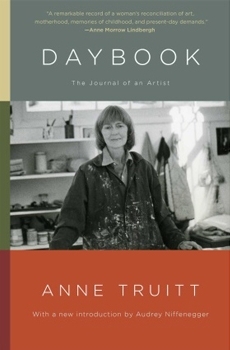 We do not expect our artists to be adept at both painting and writing, skilled in fashioning material and the written word, which is why Anne Truitt’s published journal, titled Daybook, is a rare thing. Truitt, a pioneer of minimalist sculpture, was also an extremely elegant and thoughtful diarist, and understanding the artist’s mind and work through this volume is full of both pleasure and clarity. Daybook is a view into the artistic life as it is: absent of the frills we might yearn for when imagining artists’ lives, but still somehow honestly romantic. The impetus for the book is as poetic as its contents: Truitt resolved to keep a journal following a year which saw two retrospectives of her work. Forced to confront her sculpture and painting outside the studio, Truitt suffered a postpartum depression of sorts. Daybook was her means of reasserting the self that she feared she had lost in bringing her body of work to the public. By its close, she acknowledges she looks at its pages as a snake might regard its hollow, shed skin. What results is therefore at once a widely inclusive exploration of the artist’s inner life from childhood through to the present (which happens to be the year 1974) and, as it is a diary, a straightforward notation of the day-to-day. (At some point she tells her journal of an outstanding bill for $92.) From both we can draw profound conclusions. What makes this work different (and I would argue more interesting) than other intimate depictions of studio life (that is, of depictions of male artists in the studio) is Truitt’s exploration of her dual role as artist and mother, both equal in her hierarchy. At the time of its writing, Truitt was a divorced mother of three, living in Washington, D.C. She writes and worries about her children as often as she writes and worries about her work. What is always astonishing in reading the “behind-the-scenes” of any artist (both male and female) is how necessary their practice is to their being. Though she often wonders off of what earnings she will support her family, the surefootedness, sometimes lightheartedness, with which she approaches her work is beyond reproach. There is never an alternative to the life of an artist. 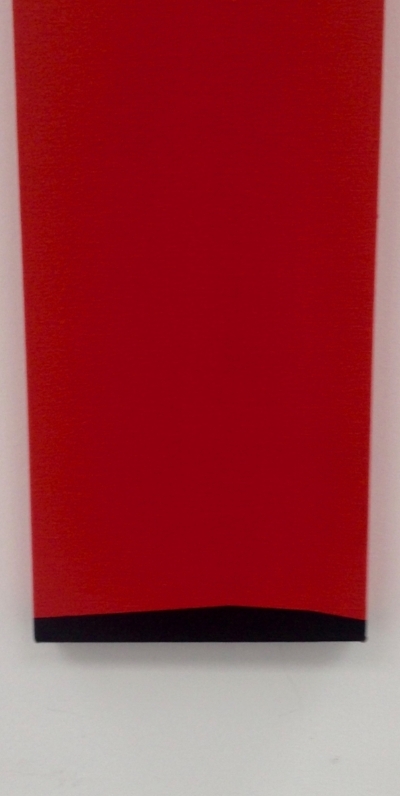 Take Daybook, then, in the context of Truitt’s work, now on view at Matthew Marks Gallery on W 22nd Street, at which an exhibition of the artist’s paintings hangs until October 27. Try imagining the artist rushing out to her backyard studio to add another layer of paint to her work before she called her children to dinner, a ritual she often writes of in her diary. Opposite each other in the gallery hang Prodigal and Messenger, eight feet tall and eight and a half inches wide, awkward and gangly as a teenager post-growth spurt. 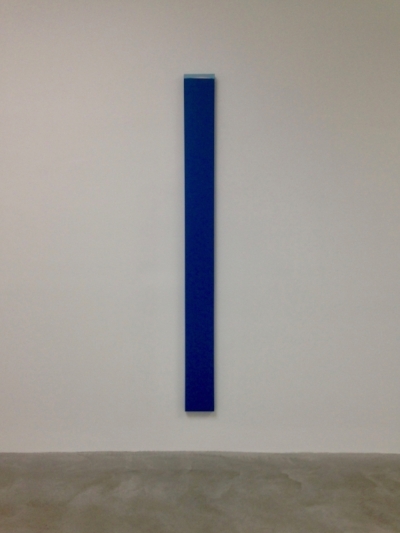 In Prodigal, a thin red stripe rests at the very top of the purple canvas, a weight that threatens to topple the painting forward. Messenger, however, is the inverse, and is defined at its lower edge by a black stripe at its bottom. 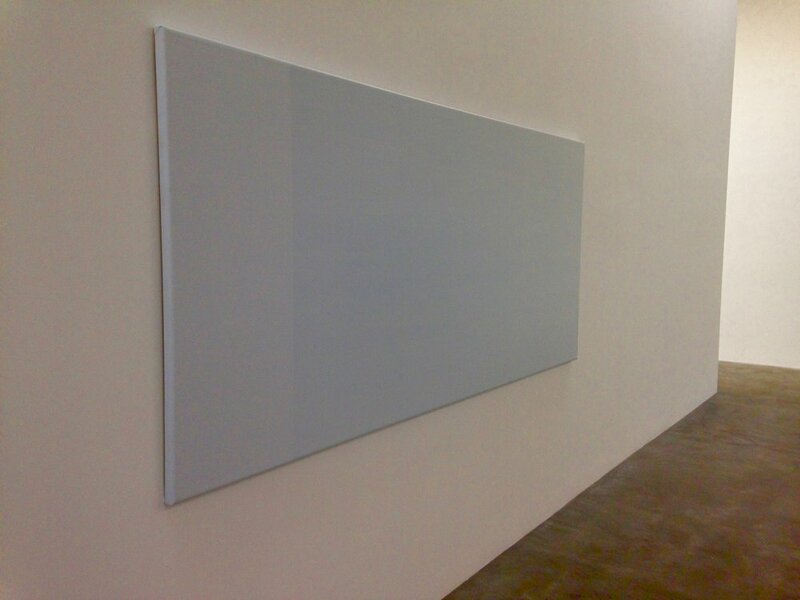 The opposite tensions in each of these canvases cancel each other out and create a symmetry in the gallery. All is not even, but all is balanced. A life is not so different. While Daybook is a chronicle of the difficulties of motherhood, it is not a story of its impediments to the artist. And though Truitt makes the distinction between the artist and the mother, as if they were different women, they share affection for one another and are indebted to each other for their individual successes. They are friends who need each other— the mother needs the artist to keep her from falling into sentimentality, from being too overwhelmed by the implications of her children’s growing up, and the artist needs the mother to remind her of the meaning behind her art. Neither is possible without the other. To read Truitt’s construction of herself, a woman born just two years after women’s suffrage was passed, is to hear wisdom from the mouth of one of feminism’s elders. While feminism has moved on from the first wave of the suffragettes, Truitt has something to say to the current generation. It is refreshing to hear of motherhood as a positive, a motivator, and not a roadblock, where success is remarkable because it implies a woman has bested her circumstance as mother. We are told we must choose, as if being a mother and being a professional were separate, and if we do choose to be both, one must not affect the other. But why? Being an artist and a mother is a story of being in cantilevered balance: either is precarious, but one keeps the other in check. Truitt proves that each part of ourselves is part and parcel of the others.